Healthy Loser Gal: One Hundred Pounds Lost & One Year Anniversary of Maintaining! Hallelujah! One Hundred Pounds Lost & One Year Anniversary of Maintaining! Hallelujah! Through the emotional ups and downs of a crazy year, I've maintained my 100 lb. weight loss and have made it to the one year anniversary! I'm fist bumping myself!! I thought last year was a milestone when I hit the one hundred pound mark, but this year, in many ways, proved to be more difficult and so - for me - the celebration is sweeter. 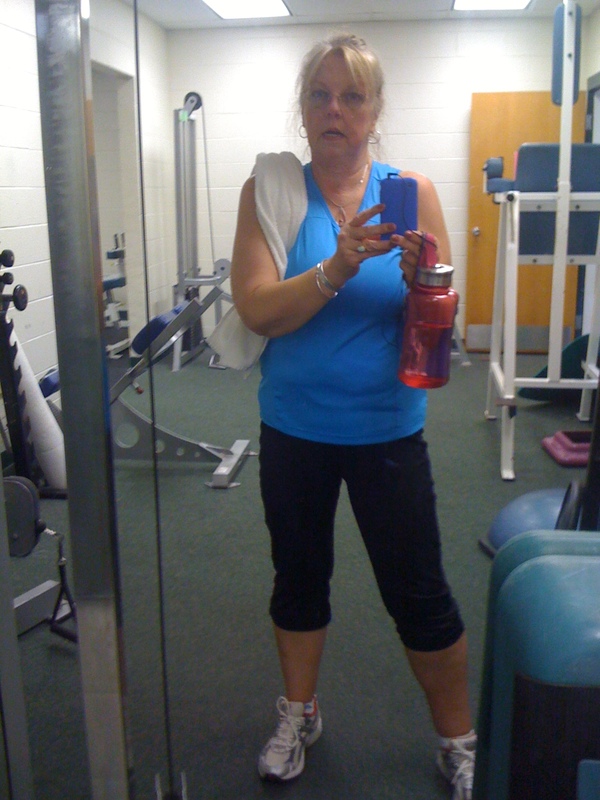 At New Year's I was down a total of 122 pounds and felt incredible... I remember working out at the YMCA the week between Christmas and New Year's and thinking "I have this... this is habit now... this is so cool!" Little did I know that with the new year would come emotional personal drama and with that all my new healthy habits would be challenged. And little did I know that I would fail miserably in some of those challenges and begin to let weight creep back onto my body. By mid-March I had stopped exercising regularly and began to back pedal dramatically 'til I took contol of things and kicked the drama out of my life, reclaiming me again. The lessons I'd learned about portion control and walking and exercising were back front and center in my life and I began to drop the excess weight I'd put on, turning my own emotions back to "positive" from having slipped to feeling negative. While in January I was only 15 pounds from my goal weight, tonight I am 28 lbs. away. But I feel good again, feel healthy once more and have been exercising regularly and eating healthy without thinking about it. That habit has been learned and not broken. I eat remarkably good foods and continue to lose weight when I keep my walking up. What I'm concentrating on now is getting myself backed to how toned I was in January. Let me tell you something - when you're working out and getting into shape - don't take a break because you're going to very quickly lose that momentum! That is a valuable lesson I learned this spring! What's my new goal? I have a special event coming up in October that I'd like to be 15 lbs. lighter for. I'm setting my first 5 lb. goal for September 10th. I believe in my own abilities and what I've learned over these last two years and know I'll be able to make that goal. What I hope you know is that if *I* can lose this weight and get healthy after having been morbidly obese and having NO fitness in my life whatsoever, YOU can do this, too! If you need some help... just ask me and I'll do what I can to get you on the right path! You Rock!!!! What a hero you are for me and so many people! Jan you are amazing!!!!! The way you have kept on going through everything you have went through this year. Think about how strong (inside) you have become since loosing the weight. You now know you can do anything and you do not need someone in your life that is going to bring you down. Keep on rockin it girl!!!!!! in so so many ways. Way to go girl! 100 pounds is an amazing accomplishment! I just started following you, I can't wait to see where you are in another year!